Injectable treatments are used to smooth out wrinkles on the forehead, around the eye area and frown lines. Also, it is used to lower the upper lip for people who show too much gum tissue when smiling. Another very effective area is to treat the ‘chewing’ (masseter) muscles which can be overdeveloped giving a very square jaw look. This is especially good for people who grind and/or clench their teeth a lot. The treatment is a way of protecting the teeth from further wear and tear as well as protecting crowns and bridges. Excessive sweating (hyperhidrosis) is quite common and unsettling for the sufferer who might want to restrict their contact with people as a result. Injectable wrinkle reduction treatment can be used to treat this condition effectively. It works by blocking the nerves that stimulate the sweat glands to produce sweating. This can be underarm or areas such as the forehead and hands. Appointment length can vary according to the area being treated and the effects last for between 3-8 months. A solution is injected into the muscles. The injectable wrinkle reduction procedure takes 1-2 weeks to take effect and will gradually wear off after 4-5 months. The procedure takes about 15 minutes with the clinician. Afterwards there might be a slight redness at the injection sites which should disappear quite quickly. The cost of wrinkle smoothing treatment varies depending on the amount required. Please contact us to hear about our current exciting offers for this product. Dermal fillers are used to correct creases, folds, scars and re-contour your face and mouth. This effectiveness is determined by the size of the filler particle in each product and the depth in the skin at which they are injected. Dermal fillers are generally used on the face, hands and décolletage. The aim of lip enhancement is to improve the appearance of your lips by increasing their fullness and/or defining their contours. It is common to wish for fuller, more sensuous lips. From our late twenties it is often noticed that our lips become thinner with fine lines eventually appearing around the mouth. You decide how subtle or obvious you want your lips to appear. For lips we use Restylane Lipp or Juvéderm UltraSmile. Dermal fillers give results that are immediate and excellent for naso labial lines, marionette lines and forehead creases. The fillers can maintain this look for about a year. This can help restore your confidence in your appearance. Your face will look smoother and younger. For these areas we would normally use Restylane Perlane or Juvéderm Ultra. Cheek augmentation restores lost volume and addresses the sagging effects associated with the loss of the fat pad within the cheeks. We can give you back the natural shape in your cheeks or even a new shape returning your Y-shape of youth. Your chin can also benefit from this product to give it a more pleasing appearance. Restylane Sub Q and Juvéderm Voluma are bulk fillers containing large particle sized hyaluronic acid. Products such as Restylane Vital and Juvéderm Hydrate are used to re-hydrate the skin in broader areas of the face, hands and décolletage. They are an overall skin treatment product used in wider areas rather than specific places where other fillers are used. The treatment is performed in stages usually three sessions with a month in between. They have an accumulative effect with the optimum results after the third session. Restylane and Juvéderm products all contain hyaluronic acid. This is a natural ingredient of the skin whose function is to hydrate and lubricate; its loss with age means the skin loses its elasticity and volume. With these products the hyaluronic acid is used to improve the biophysical properties of the skin. 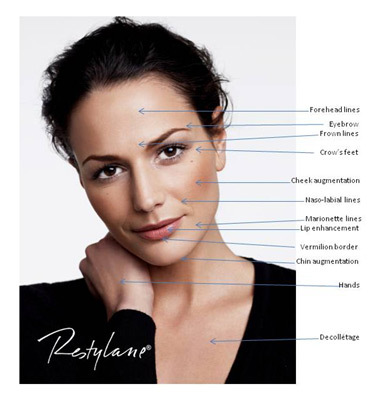 All Restylane products are derived from non-animal sources. We offer a topical anaesthetic for your comfort with all our aesthetic procedures. Most of these products, now available, include an anaesthetic solution in them. This reduces any discomfort felt during the procedure. For those people who are very sensitive to pain a local anaesthetic can be administered. This results in complete numbing of the area, which is particularly useful for lips and cheeks.